The Apple iMac packs high-performance processors into an aluminium and glass enclosure with up to 40 percent less volume than its predecessor and a near flat display that measures just 5mm thin. All iMac models have two Thunderbolt 3 ports and up to 16GB RAM. Ships with Magic Keyboard and Magic Mouse 2. The 2019 iMac 21.5" Retina 4K features 6-core 8th Generation Intel Core i5 processor for high performance. With Three years warranty when you lease a new iMac from HardSoft in Ireland. The most powerful iMac yet featuring new 8th Generation i5 or i9 processors, high-performance Radeon Pro graphics and Thunderbolt 3 yet still remains incredibly thin, plus the amazing Retina 5K Display for crisp, clear imagery. The new iMac Pro is a supercharged, space grey 27-inch iMac with 5K Retina display that includes up to 18-cores of super fast Intel Xeon processing & AMD Vega graphics. Choose our Flexi-Lease option to get ownership or Pure-Rental and take a 20% discount in return for giving the iMac Pro back at the end of 3 years. Mac Pro is the professional desktop reinvented from the inside out. 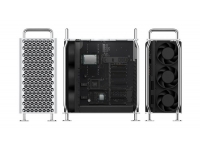 Engineered by Apple to grant access to workstation graphics with dual GPUs, PCIe-based flash storage, high-performance Thunderbolt 2 ports, ultrafast memory, Xeon processors, and support for 4K, this new Mac Pro delivers state of the art performance across the board. 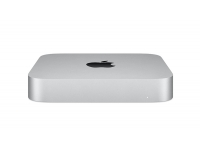 The Mac mini has FINALLY been given a new lease of life. With 8th generation Intel processors, increased RAM & SSD Storage Space coupled with ThunderBolt 3 Ports the Mac mini is certainly back! 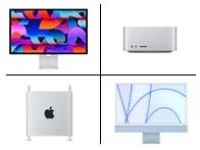 Take a look at the complete range of Apple Mac Desktops ........mini, iMac, iMac Pro and Mac Pro ... All available on a 3-year lease with HardSoft, spread costs and keep your cash in the business and as if that wasn't enough, you will receive a full 3-year warranty included in our price. The 2017 revised Apple MacBook is the thinnest notebook on the market but is still brimming with improved features. The new 12" Retina display is more energy efficient than any other Retina display and just as bright. Faster graphics, faster Kaby Lake processors and even an i7 CPU. 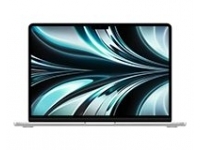 The 2018 MacBook Air 13" features all-day battery life and is powered by Intel i5 1.8GHz or i7 2.2GHz processors... The MacBook Air can be in your hands the next day! On our flexible lease contracts. The new 2018 MacBook Pro 13" with or without Touch Bar is still just as thin and light as its predecessor and boasts a pretty amazing 10 hours of battery life and the latest Thunderbolt 3 connectivity. The 13” model is configurable up to 1TB SSD and 16GB RAM featuring dual-core seventh generation i5 or i7 processors. The new MacBook Pro with Touch Bar is available to lease to businesses throughout Ireland. The new 15-inch MacBook Pro weighs in at just 1.83Kg and an ultraslim 15.5mm, four Thunderbolt 3 ports, Six-Core i7 CPU's clocking in at up to 4.1GHz. and a maximum capacity of 4TB of PCI-e SSD. This is a premium machine and comes at a premium price so leasing this MacBook in Ireland makes business sense with our three years warranty and flexible leasing terms. Available in traditional Silver and the popular Space Grey. 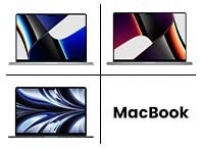 HardSoft lease the brand-new 2018 MacBook Pro 13" and 15" with or without Touchbar, 2018 MacBook Air & the 12" MacBook. We have a variety of specifications on offer if you check out our product pages. Any questions or can't find what you're looking for then give one of our friendly sales team a call on 014853026. Bespoke/custom builds are also available. Revolutionise the way you work with the iPad Pro, featuring an 11" or 12.9” Liquid Retina Display and the powerful A12X Bionic chip and Neural Engine. New accessories including the Smart Keyboard and Apple Pencil enable you to work whenever and however you want. Flexi-Lease today for a 3 Year ‘Collect and Return’ warranty. 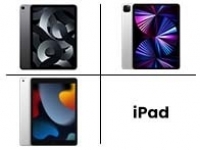 The new iPad features the new 64-bit A10 chip. Using Retina screen technology and twin speakers. Security is also boosted by the debut of Apple's Touch ID Technology. For your peace of mind, all Apple iPads come with 3 years warranty. 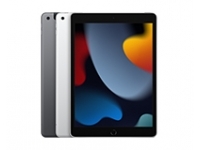 You can lease a new Apple iPad with either WiFi or WiFi + Cellular with a choice of storage. 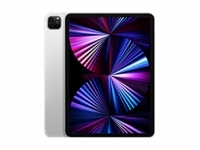 If you’re looking for something bigger and better, the Apple iPad Pro is available to lease from HardSoft with Wi-Fi and Wi-Fi Cellular models available. Leasing a new computer has never been easier with Hardsoft's new e-sign paperwork and 3 years no quibble warranty. We have a choice of software and displays that can be added to any lease to make your deal right for you. HP is a huge distributor in the Computing and PC market. 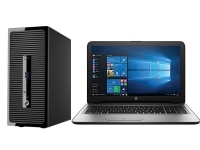 If you prefer a Windows computer over an Apple Mac then you need to look at leasing an HP desktop PC. 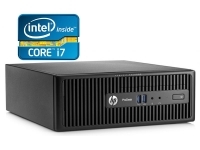 HardSoft now offers a choice of Hewlett Packard computers. 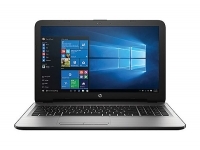 Lease Windows laptops and desktops from HP in Ireland, if you cant' find your perfect computer then just ask us. 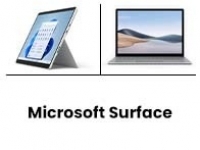 The next generation of the Surface product line, the 2018 Microsoft Surface Pro 6 has redesigned features and updated accessories. Lease the ultralight & versatile Surface Pro 6 for your business with a HardSoft Flexi-lease in Ireland. Leases now available on the Microsoft Surface Book 2 with a 13.5" or 15" screen. Work, play and create without limits. 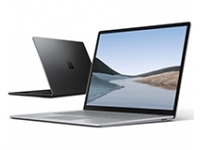 The Microsoft Surface Laptop 2 is now available to lease and hire. The new Surface Studio 2 will be availble in 2019 to lease in Ireland. Choose the Surface Pro 6 with 12.3" display or the Surface Book 2 laptop with fully detachable 13.5" or 15" display i7. Hiring a Microsoft Surface makes business sense with 3 years no quibble warranty. The Microsoft Surface family are designed for people who work on the move. The Microsoft Surface Book is ready to lease from HardSoft. It's light, powerful and available with a number of updated accessories, the user experience is better than ever. With the astounding variety of Surface products available to your business, you will always find a spec to suit you. With different accessories to compliment your new device, why look elsewhere? Why not take one today with a HardSoft Flexi-Lease, which allows you to change, modify and upgrade your equipment after 2 years, ensuring you always have access to the latest technology available. If you can't see what you are looking for, contact one of our dedicated HardSoft sales team with our live chat feature in the bottom right-hand corner of your screen or email us on sales@hardsoft.ie or call 014853016. Copyright (C) 2019 HardSoft Ltd. Company Reg No; 05938604. HardSoft is a Registered Trademark. All rights reserved.